This PCIe video capture card�lets you record 1080p HD video and 2-channel stereo audio (HDMI/RCA) to your computer system. With multiple video inputs, including HDMI, DVI, VGA and component, this all-in-one capture card can record original content from virtually any device. You can install the card into any low-profile or full-profile PCIe slot, including fixed workstations�such as 2U or 4U rack-mounted servers or�media centers. Installing your capture device internally through PCIe�ensures a�secure and�reliable way to capture video. The included software encodes captured video in H.264 -- the most widely adopted video compression standard in the world. This ensures your video captures are compatible with most device platforms such as PC, Mac, iOS and AndroidT. 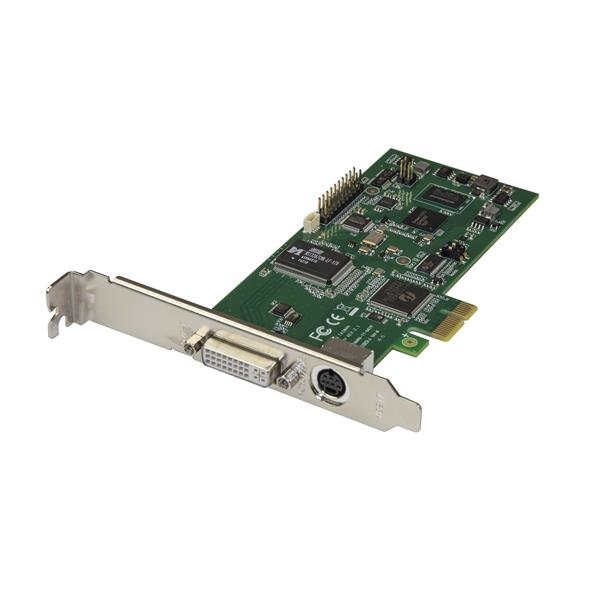 This adapter card features DVI-I signaling and multiple adapters to support many video input�types. With multiple A/V input options, you can capture video from a wide variety of sources including HDMI, DVI, VGA, and component. You can also expand the capabilities of this capture card by using A/V adapters to record from other video sources such as SDI, using our [%product id="SDI2HD" text="SDI to HDMI converter"%]�(SDI2HD) (sold separately). Support for a variety of A/V devices and signals is ideal for archiving analog video footage into a digital database.